Being able to take a punch is not a study in being submissive, nor should it be a practice of absorbing shots with your face or body. It’s about developing defensive skills and physical fortitude to address the inevitability that, if you’re mixing it up with another fighter, you’re going to get hit. A worthy opponent is going to serve you a feast of punches, but that doesn’t mean you need to eat all those punches like you’re a hungry heavy bag. Part of stand up fighting is about not taking punishment. but you can at least keep the shot from landing cleanly. First, let’s address your attitude in the ring. You must protect yourself always, but, at the same time, you absolutely need to avoid being scared stiff. We recently reposted an article about the need for calmness and the power that comes with being willing to be hit. Through practice, from sparring and competition experience, you will gain an understanding of what to do when a punch comes your way, which will ultimately give you the necessary confidence to be at ease. So now that you’re (relatively) calm, you’re better able to see fully what’s happening. While you don’t want your pretty face to become a nice round target, you can’t take your eyes off your opponent. If you shut your eyes to “hide” from the 1 punch you won’t see the 2 punch in time and it’s going to hurt. Only by keeping your visual attention on your opponent are you able to recognize what’s coming and know what counteraction is called for. Keep your eyes open and see the shots as (and before) they come. You’re going to get hit in the gut at times so train to toughen up those core muscles. Here’s where you want that stiff, yet flexible midsection so you’re braced for the hit, but not a fixed target. Likewise, your neck should be strong and still as flexible as possible. So look to add some dynamic strength exercises to your training. In this way you can lessen the impact of a punch because your muscles protect you at the same time as they keep you mobile. A significant part of stand up fighting is about not taking punishment. You’re never going to block and make every shot miss, but you can at least keep the impact minimal by keeping the shot from landing cleanly. There are many techniques for avoiding a shot and you should try as many maneuvers as you can to find the ones that come the most naturally to you and develop and practice these skills in the gym. Sparring, of course, is a great way to get experience with reading and recognizing an opponent’s offense and practicing maneuvers and blocking technique. You can also get our your clothesline and do some rope slipping. Your goal is to make your defense as close to second nature as possible. React without thinking. Again, you’re never going to block or duck everything that comes your way, but with good technique and skill you can make it so the shots that get through don’t do any damage. So relax, keep your eyes open and practice often. 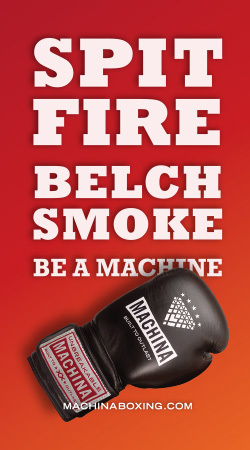 Posted on December 2, 2014 by Fuel for the Machine and tagged punches take a punch confidence.